Hello my gorgeous Native people, I wanted to give you an update after not posting anything but show fliers for the past few months. The last half of 2013 was a busy time of the year, and part of that was the excitement in having the gallery up for 1 year. So I wanted to thank everyone for not telling me that an Indigenous gallery would not work on Roosevelt, thank you for not showing up and letting other people view the beautiful art, and most of all thank you for keeping the controversy away. I give these thanks after a successful first year at 1Spot Gallery. The gallery has enabled me and other indigenous artists to generate a voice and presence in the downtown area, and we couldn’t have done it without everyone’s support. 1Spot Gallery is “your” gallery, downtown Phoenix. Along the way we created some thought provoking shows and generated interest in the tidal wave that is enveloping indigenous arts and changing collectors perceptions on what indigenous arts are supposed to be. Part of this renaissance that is occurring right now is due in part to the younger generation of artists finding their voice and seeing there is a difference between selling their vision and selling the culture itself. A wise artist sage once told me that in order to become a successful artist, you have to provide an unflinching display of your art that is manifested from your experiences and does not rely on selling the Dine culture. Although this famous artist was in fact selling his culture through his art, his words stuck in my mind. My earliest work draws from the ceremonies and myths that once governed our lives and provided the people with balanced living, “hozho’.” From these early beginnings I steered and cajoled my ideas into compositions where I’m relying more on my skills and less on displaying our gods and sacred symbols. There are still certain paintings where I do portray a Yei’, that’s for sure, but I’m becoming more comfortable not trying to rely on depicting any particular deity or symbology, aside from universal symbols and inherited designs. Viewing different people’s reactions at art shows is always interesting, there are the eager people who show up right when a gallery’s door opens, scans the room while taking pictures of the work shown and promptly exit without uttering a word. Then there are art shows and events that generate lots of traffic and include various buyers/sellers/art connoisseurs, and no where is that more evident than at the Navajo Nation Fair. People would mouth silent awes or mutter incoherently with wide open eyes. A fair amount would start asking questions on why the art was so different. The majority though would walk past my booth with nary a raised eyebrow. My disheartening view on this sad state of affairs was changed when an elderly gentleman engaged me with interest on my art, and wanted to know the reason it was so different from the “traditional” art dominating the market. After reminding him that every facet of Navajo life involved some aspect of cultural assimilation from other invasive cultures; Navajo silversmithing, the transfer of sand paintings from temporary ceremonial artifacts to permanent wall hangings, Navajo rugs that came to fruition after incorporating livestock into the culture, He gained enough respect from our conversation that he left my booth with determination to further explore the new wave. Beside the Navajo Nation Fair trip, we also made a trip out to Santa Fe this year for Indian Market. We mostly relaxed during this trip, but we did take advantage of as many shows as we could fit in during this short time, and we came back to Phoenix with a renewed vigor for good Art. All of which led to the successful Movie Poster show during the last half of the year. 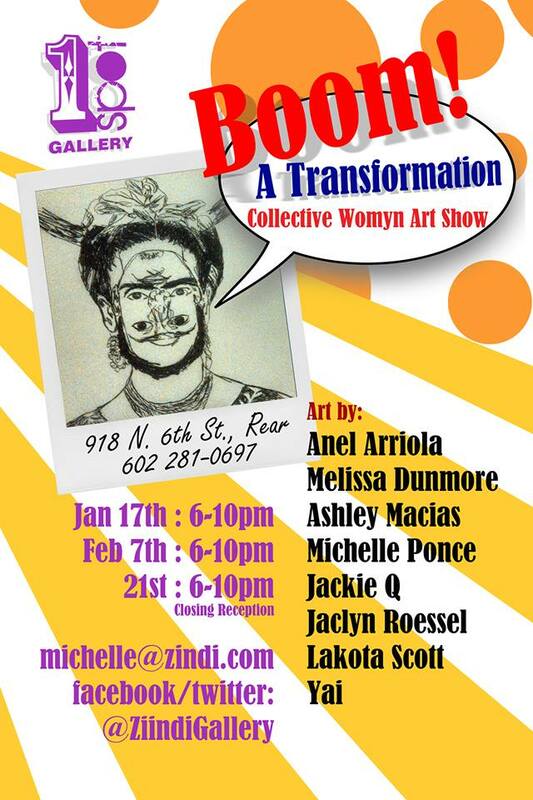 This year we’re already mixing it up with an all female cast for “BOOM: A Transformation – Collective Womyn Art Show.” This show features new work from Phoenix’s up and coming female artists. We’re also partnering up with Contemporary Native Art Magazine (CNAM), in March-April, for a star studded event. But first off CNAM’s winter issue is out and I’m one of the artists interviewed for this issue. CALL TO ARTISTS! As our mission is to encourage young artists to create contemporary art, we created a “Visionary Award” – please spread the word wherever you are!! Deadline for submissions is 1/31/2014. 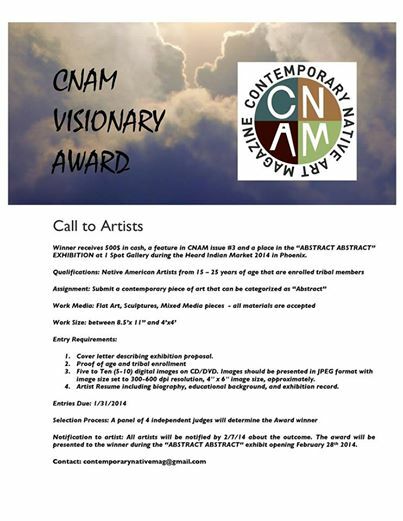 Please forward and encourage any indigenous artists you know to apply, CNAM and 1Spot Gallery will be including the winner in the March show, please submit your work by 1/31/2014. I have new pieces all the time, I just completed and am in the process of putting the final coats on 3 new pieces for March, I’m working on completing another painting for Art Detour, and I’m starting 2 new canvases. Thank you to everyone and drop by the gallery and see what this gallery has wrought the next time your in Phoenix, its well worth the trip and the conversations.